Dual-ended pencil imparts the definition of a pencil with a soft-powder finish. The brush tip blends and shapes the brows to perfection. The shade is the in Soft Taupe ~ beauty experts the world over, agree that this shade works with all shades of brows. 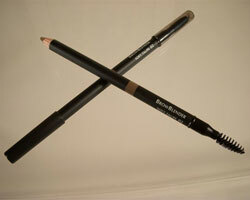 For Blondes and Redheads ~ a little touch with the pencil is all you need to give your brows a lift. For Grey brows ~ simply apply a bit more pressure to create your best brows. For Brunettes and Raven haired gals ~ use more pressure to the pencil tip when applying to get your rich brow depth.